Pilot Of Plane That Crashed In Nepal Reportedly Was Confused About Runway Approach : The Two-Way At least 49 people were killed in the crash of the Bombardier Dash 8-Q400, carrying 71 passengers and crew, at Kathmandu's main airport. Nepalese rescuers work after a passenger plane from Bangladesh crashed at the airport in Kathmandu, Nepal, on Monday. The pilot on a US-Bangla Airlines flight that crashed at Nepal's main airport, killing 49 of the 71 people aboard, was apparently confused about which direction the plane should use to approach the runway. The airline's CEO Imran Asif accused Kathmandu's air traffic controllers of giving the pilot the wrong instructions, according to Reuters. "Traffic controllers asked the pilot if things were OK, and he replied, 'Yes.' The tower then told the pilot his alignment was not correct, but there was no reply, Chettri added." "'The plane should have come from the right direction,' Chettri said, adding that it hit the airport fence, touched the ground and then caught fire. 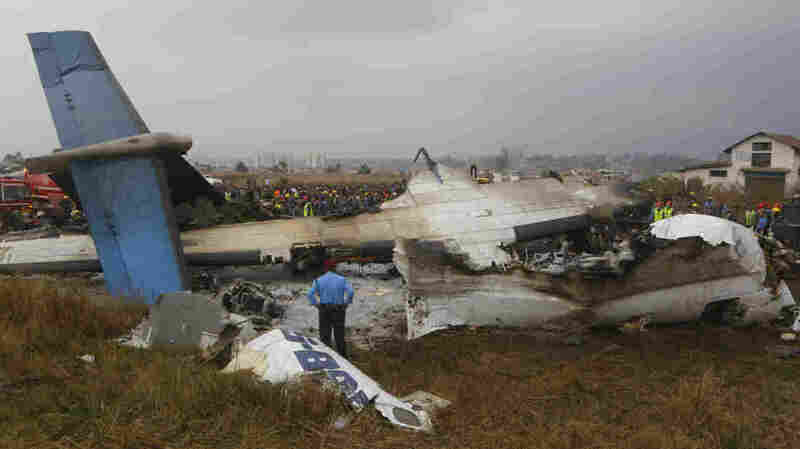 It was not immediately clear if the pilot had issued a 'Mayday' call, or distress signal." In a recording by air traffic monitoring website liveatc.net, the pilot can be heard asking for permission to land the Bombardier Dash 8-Q400 from the north, which is granted by the air traffic controller. Moments later, the pilot says he is on approach from the south, and the controller also approves that approach, according to The Associated Press. "A separate conversation between the tower and a Nepali pilot added to the sense of miscommunication between the controllers and the pilot of the Bangladeshi plane before the crash Monday. 'Looks like they are really confused,' one man says in Nepali talking about US-Bangla Flight BS211. 'They appear to be extremely disoriented,' another man said. Just before landing the pilot asks, 'Are we cleared to land?' "
The Kathmandu Post adds: "Director General of Civil Aviation Authority of Nepal (Caan) Sanjiv Gautam said that the plane was out of control when it attempted to land on the runway. 'The aircraft was permitted to land from the Southern side of the runway over Koteshwor but it landed from the Northern side,' said Gautam suspecting the aircraft might have sustained some technical glitches. 'We are yet to ascertain the reason behind the unusual landing.' "
A police spokesman Manoj Neupane said Tuesday that 49 people were confirmed to have been killed and 22 injured, according to the AP. The Post quotes Nepal Police Spokesperson DIG Manoj Neupane as saying 22 injured passengers were undergoing treatment at various hospitals in Kathmandu.